Over 150 people attended our launch event at New York Stadium on Wednesday 29th March, had coffee and cake and heard about some inspiring new developments happening in Rotherham. 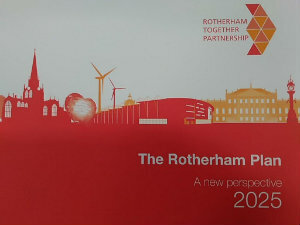 The event, hosted by Council Leader Chris Read and the Rotherham Together Partnership (RTP), launched the ‘Rotherham Plan 2025: A new perspective’, which sets out the most important things local partners will do over the next few years to help improve Rotherham as a place and make life better for local people. People also heard about major town centre developments in the pipeline including the new University Centre and plans for the Forge Island site.